At Thorneycroft, our family law solicitors understand that relationship breakdown problems can be hugely unsettling, emotional and can also have serious financial implications. If you are facing a marriage breakdown, or any other family dispute, you can be safe in the knowledge that you are talking to specialist family law solicitors who will provide you with the full support and sympathetic understanding you require to make the right decisions for you and your family’s future. Our solicitors have an in-depth knowledge and experience of family law with a key focus on value for money and client satisfaction, which makes us the leading choice in the Macclesfield, Buxton, Holmes Chapel and Whaley Bridge areas for legal advice and support about the financial and other issues arising from divorce and relationship breakdown. At Thorneycroft Solicitors, we appreciate that no two families are the same and that each situation will require individual attention. Our family law solicitors have worked on numerous different divorce settlements in Macclesfield, Buxton, Holmes Chapel and Whaley Bridge and have gained a wealth of experience. They handle each case with expertise and compassion from start to finish and will handle your situation in complete confidence. As one of Cheshire’s leading family law solicitors, we have the expertise and resource to deal with even the most complex family issues. Where a situation cannot be resolved amicably through services such as family mediation or the Collaborative process, we will look at the appropriate route in order to ensure that your interests are properly represented. How can our specialist family solicitors help you? 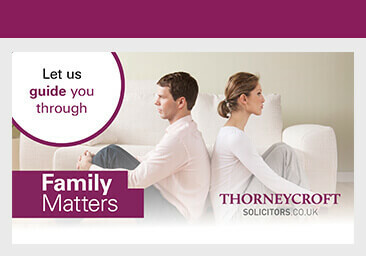 Thorneycroft Solicitors are family solicitors who provide a complete service for our clients. We offer an initial consultation where we will provide you with advice on all aspects of family law and discuss the options which are available to you and your family before deciding on the best way forward. If you are looking for expert advice on family law or matrimonial issues we can help.